Day One of jury selection has concluded in the murder trial of David "DJ" Creato, accused of killing his three-year-old son, Brendan, in October 2015. On Wednesday, Camden County Superior Court Judge John T. Kelley will merge a new pool of potential jurors with the vetted jurors from Tuesday. Selections and challenges will continue until a full jury of 12 (and two alternates) is seated. Opening arguments are expected to begin Thursday. About half of the jury pool came forward to speak to the judge in sidebar conferences during voir dire on Tuesday, with Camden County Assistant Prosecutor Christine Shah and defense lawyer Richard J. Fuschino Jr. listening in. Creato, the defendant, in a suit and tie, his long hair gathered in a ponytail and his beard tightly trimmed, listened from the defense table through the court's recording system. By the end of the day, Fuschino had made preemptory challenges on eight jurors, with Shah striking seven. Four potential jurors, including one who was visibly pregnant, was excused by the judge. One of those jurors was dismissed because she works with a possible witness and said she could not put her friendship aside. In a criminal murder trial in New Jersey, the defense gets 20 preemptory challenges, while the prosecution gets 12. Many potential jurors – about a third – had some familiarity with the location where Brendan's body was recovered. And a large number had relatives in or associated with law enforcement. Jurors were asked if they know any potential witnesses in the case. They also answered a list of questions intended to identify any bias. And they were asked to tell the judge if they have personal issues or calendar conflicts with the likely trial schedule. Kelley told the jurors the trial could last through May. Trial is set for Tuesdays, Wednesday and Thursdays, with Mondays and Fridays off except during deliberations. There are also three days in May when the judge has other obligations. That could mean the trial will last 17 days. The judge also read a list of potential witnesses in the trial. They include DJ Creato's ex-girlfriend, Julia "Julie" Stensky, who the prosecution says resented Brendan; Brendan's mother, Samantha DeNoto, and her boyfriend, Matt Holshue; and several members of the Creato family. Others include three members of the county medical examiner's office; the state of New Jersey's medical examiner; Dr. Mark Taff, a consulting pathologist; and numerous law enforcement officers, including the K-9 handler who discovered Brendan's body in a stream about a half a mile from the apartment he shared with his father. Before the jury vetting began, permission for the media to take photos in the courtroom of the lawyers and judge – but not the jury pool – was abruptly rescinded. 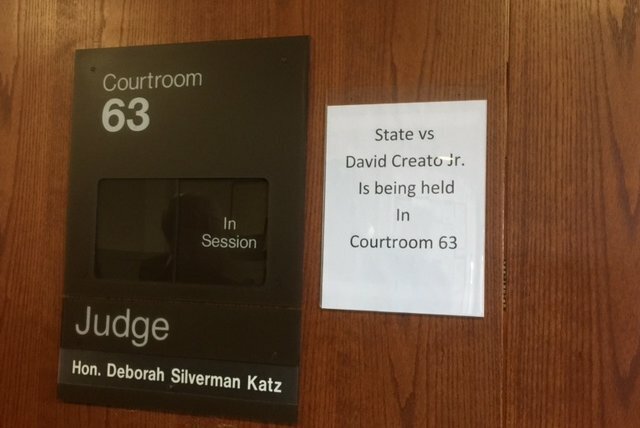 The judicial district's presiding judge, Deborah Silverman Katz, who had signed permissions for about a half a dozen members of the media, told journalists assembled outside the courtroom that the decision to bar all cameras was made at the request of Kelley. Katz threatened to deny photo permission for the length of the trial to one journalist who questioned why the blanket ban was imposed for jury selection despite the court approving such requests in advance.